The dromedary camel (Camelus dromedarius), also known as the one hump camel or Arabian camel, makes up 85% of the world camel population. 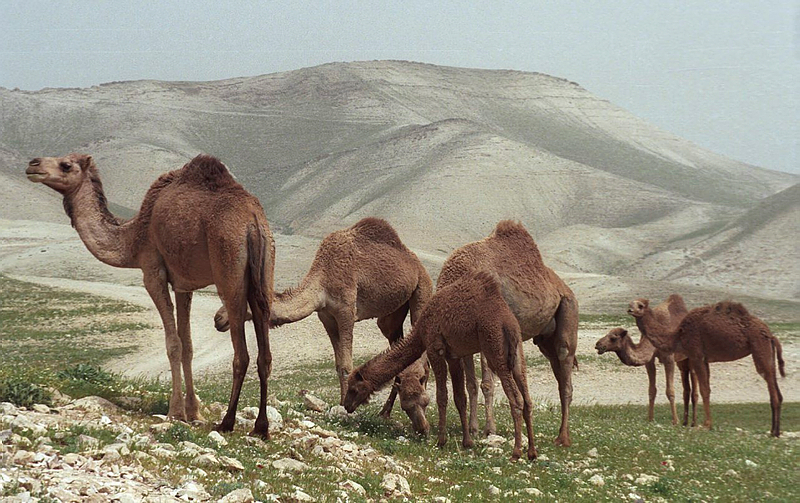 Collectively called a caravan, flock, train or herd, it inhabits the Middle East and is found in abundance in both the Judean and Negev deserts. The name camel is derived from the Hebrew “gamal” גמל, and is mentioned numerous times in the Bible. It can weigh between 300 to 1000 kg, has a life expectancy of 40 to 50 years, and can reach a height of 2.85 meters to the shoulder and 2.15 meters to the apex of the hump. The question that begs an answer is how such a large animal is able to survive and thrive in such a hostile environment? The answer to this question one can say exposes us to the divine hand of the creator. The widening toes, broad gait & webbed feet allows the camel to navigate varying soil conditions enabling it to run at 65 km/h over short distances and 40 km/h over longer distances. The long legs distance its bulk from the hot ground and the thick coat insulates it against heat radiated by the soil. The coat acquires a lighter color in summer thereby reflecting light and preventing sunburn. A pad of thick tissue covers the sternum (breast bone) so that when lying down the body is raised, allowing cool air to pass under its bulk. Long eye lashes and ear hairs, coupled with nostrils that can close, form a barrier against sand. Added to this arsenal is a 3rd transparent eyelid that is used to dislodge any grains that might have entered the eye. Perhaps the most symbolic feature of the camel is its hump. Made up of fatty tissue concentrated in one area as opposed to being distributed throughout the body, the latter of which would lead to a rise in body temperature.The fat is metabolized to produce water enabling the camel to drink as seldom as 1 in 10 days. Able to drink as much as 200 liters in 3 minutes, the blood cells are oval as opposed to round allowing them to withstand high osmotic variation without rupturing. The camel rarely sweats and is able to loose 25% of its body weight through sweating. Other animals can only loose 12 to 14% of their body weight before cardiac failure results. Camel urine comes out in the form of syrup due to the lack of moisture, and their feces is so dry that Bedouins use it to fan their fires. Though not kosher because it chews the cud but does not have a cloven hoof, it provides meat and milk for non-Jews. Their fiber and felt are and were utilized by the textile industry and from approximately 500 B.C.E. to 100 B.C.E camels started being used militarily. Their scent scaring off horses. It is said that camels were often the preferred currency, traded for the possession of a woman. I don’t know if that is true or an oasis legend. However I do know that an Arab once offered 12 camels for the possession of my daughter. We turned him down of course, I thought she is worth much more.